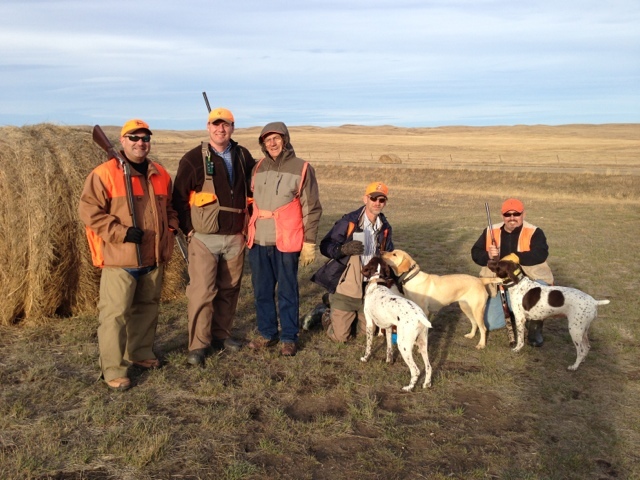 Bobby, Joe, DAD, Pete and Tim- a nice bunch of hunting companions! Right after I picked Bobby at the Bismarck airport, we began plotting our course through pheasant country. I made a quick call to the the district game biologist and the local game management office. They both agreed, the east side of the Missouri River from Bismarck to Mobridge, SD is an area with lots of pheasant. So, we headed that way, looking for likely PLOTS land (Private Land Open To Sportsmen). We noticed a huge piece, 8 sections, of land about halfway down the river and made for it. I was hunting in South Dakota for a week at this point and immediately noticed the lack of hunters! Down there, the birds are plentiful and so are the pickups towing dog trailers or toting dog boxes and Labradors. After one minor wrong turn requiring an almost insignificant amount of cross country travel, we pulled in to the area and my jaw dropped! "This can't be the place", I said to Bobby. This is the picture you would see if you looked up "pheasant habitat" in the dictionary. Cut wheat, corn, ditches, brush, and tree lines alongside cut corn fields stretching for miles! It made me nervous, but I drove the roads and found the markers and verified my location on the map. We put out on a ditch with water in it winding through cut corn with grass all along it. My Cap dog did a great job, but we only produced a few hens. At the end of the ditch, I leashed him up and we walked the road back to the truck. I heard a truck coming and got off the road as a pickup with an orange hat and a pointer pulled up. "Any luck" the driver asked as he pulled to a stop. Not yet, but the day was young, we replied. "Why don't you walk this treeline with us? Our father, who's 90, is about halfway down blocking for us." I looked over at a picture perfect situation. "We did the first half about 20 minutes ago and pushed about 20 roosters out of there, but we don't have the manpower to do it right." Sold! Let's go! I left my dogs in the truck. They are big runners and great on pheasant, but the combination of two different style dogs doesn't work too well sometimes. And we were the guest here. So, to a certain amount of caterwauling from the back of the "Beast of Birdin'", we loaded up and eased down to the treeline with two new friends and their dogs, a Brit, Lab and GSP. It was a fun, few hundred yards. The dogs stayed close, with one minor exception, and the pudgy little Brit turned out to be a fine pheasant dog. Bobby bagged two fat roosters and I managed to scare one in to submission- I think it died of a heart attack as I flung Prairie Storm lead at it. Another of the group, Joe, got one that flew back over his head. Unfortunately, he was a super shot and the bird was super close. He field dressed that bird "on the wing". We reached the end of the row, met "Dad" and another hunter, and stood around for a bit and chatted. It turns out, Dad (Don) grew up and lives in South Dakota, while the boys live in Alabama, and Missouri. In fact, one of the guys looked pretty familiar to me. He likes to run NSTRA in the Mo-Kan region and drives over to the Alabama Region, on occasion. We knew many of the same guys and probably met at a trial or two as I trial mainly in the Georgia Region, but have been known to run my dogs in the Alabama Region. They were a great group of guys, who didn't need to ask us to join them, but I'm glad they did! It really is a small world for the traveling bird hunter. The nice thing, I noticed, is the willingness to help out and get to know other bird hunters along the way. It really made our day to be invited along and we really appreciate them and their fine bird dogs.